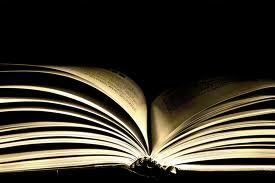 People often ask writers, Where do you get your stories? One answer is, They are all around you. Listen. 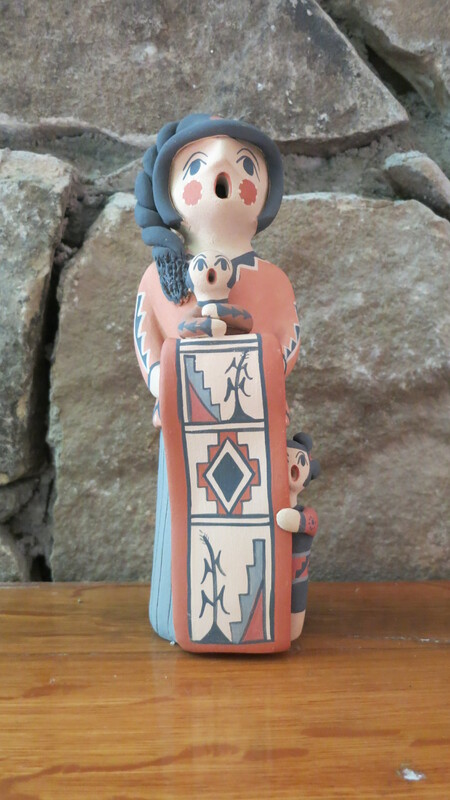 It was in the Santa Fe Museum of Indian Arts & Culture that I first saw them, a collection of clay figurines made by the Pueblo people of New Mexico. Based on the tradition of the Singing Mother, these figurines usually depict a mother with her mouth open and holding one or two children. Of all the pottery I saw in the museum, these figures were my favorite, and I wished to have one. A week later, in Albuquerque’s Old Town, Joe gave me the figurine pictured here as a belated birthday present. By then I had come to see these dolls as reflective of our time in New Mexico and Arizona, where we got married, a time when the stories of our old friends and our new and the places we visited merged into the larger story of our union. Usually, it’s the women. They meet Joe at a party. They taste some dish he’s cooked. And they ask, Where did you find him? That story’s simple. We met on line. Yes, it’s true. Sometimes those match-ups actually work. But we’re not ‘the perfect match’—whatever that means. We are a yin and yang in so many ways. He’s from Brooklyn, I’m from Atlanta. He’s a Buddhist, I’m an Episcopalian. He’s right, I’m left. He’s a great cook, I hate to boil water. You get the idea. We dated for almost nine years, and, for the last six, spent vacations checking out other places to live. We tried the coast, we tried the mountains, but found nothing we agreed on. Joe used to say he wanted to live at the beach, then decided, no, he wanted to be in the mountains but near water. Last fall, we visited Chattanooga and stayed in a cabin on the Tennessee River across from Raccoon Mountain. 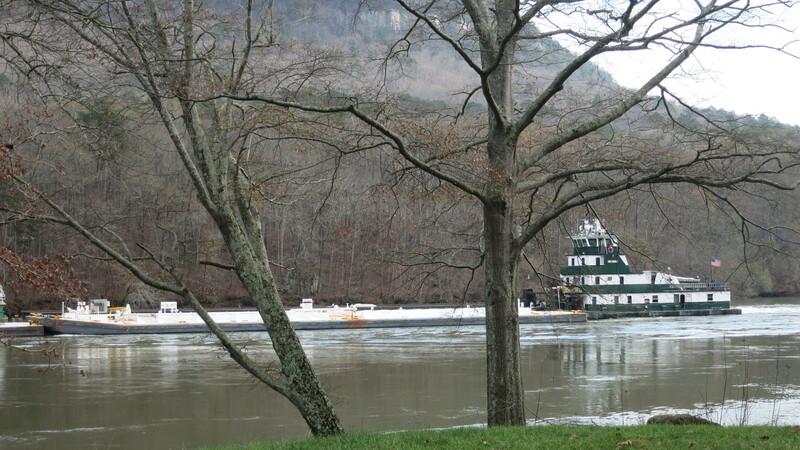 We watched tugboats pushing huge barges up and down the river, we watched the River Gorge Explorer, of the Tennessee Aquarium, cut through the waters as it took tourists downstream, fishermen in boats and on banks dipped their poles and tried their luck. Joe said, That’s a mighty pretty river. A month later, we put a contract on a house with a creek in the backyard, on nearby Signal Mountain. On Sadie Hawkins’ Day, I proposed. I didn’t want to have to wait another four years—we might be dead. A few days later, he proposed. We closed on our new house in January, I sold my house, and we moved in mid-March. Now all we had to do was get married. We’d both gone the traditional route years before. This time we wanted something different. We wanted someone special to marry us. And that person was our beloved friend Cynthia Hizer, formerly associate rector at my church in Decatur. She and her wife Margaret Putnam had gone West, left Hazelbrand Farm on the outskirts of Atlanta, to travel to Ft. Defiance, Arizona, Navajoland, where Cynthia is Priest-in-Charge at Good Shepherd Mission. Now our story, our journey, merges with theirs as we choose Ft. Defiance, a place both starkly beautiful and layered by complex history, for our wedding. If you click on the website, you’ll see that Good Shepherd, begun 150 years ago and located at 1 Kit Carson Drive, has a large campus of residential buildings (used for mission trips and retreats, and as an Airbnb) and a lovely church, designed in 1955 by famed architect John Gaw Meem, who was responsible for the adobe style that made Santa Fe like no other city in the world. Today, Ft. Defiance, in the Four Corners region and just up the road from Window Rock, might be best known from the detective novels by Tony Hillerman. But, like wind on sandstone, strip away this more recent history and discover that it was the site of a brutal exodus forced on the Dine (the Navajo) by famed Indian fighter and scout Kit Carson under the command of the US Army. To fulfill his orders, Carson had no qualms about killing those who resisted, burning homes, destroying irrigated fields, and slaughtering livestock. Eight thousand of the Dine began their 300 mile walk, the Long Walk, to Bosque Redondo. Another thousand took refuge in their sacred lands of Canyon de Chelly. But Carson swept through the canyon, cutting down thousands of peach trees and showing the Navajo hiding there that nowhere were they safe. They surrendered. 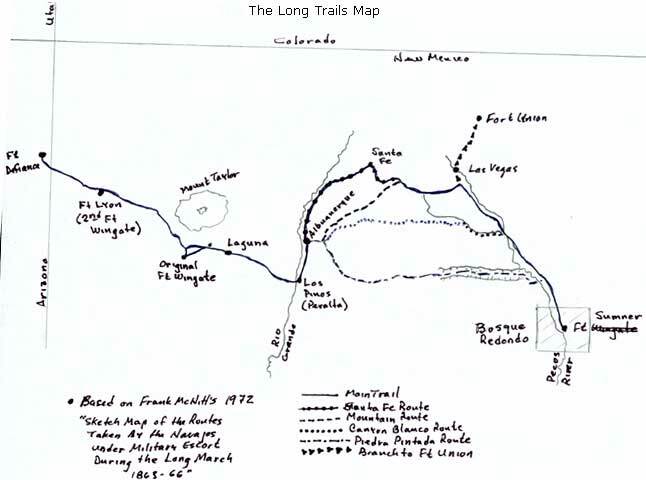 By 1866, the Army admitted that Bosque Redondo was a failure and, in 1868, allowed the Navajo to return home. Friday, the night before our wedding, we host a cookout for our guests. They arrive in the afternoon and into the evening: Joe’s brother from Seattle, three couples from Atlanta, one of my favorite former students, now living in Tuscon, and Steve, Joe’s best man from Kansas. Their lives are stamped onto our lives–their stories, our stories, too. Take Steve, for example. Years ago, he helped Joe build his dome home: a concrete monolithic dome, like a stone igloo. They are brothers in blood, blood spilled so often, as they shot concrete from great hoses onto the interior curved walls, that they became familiar visitors to the nearby ER. Now, though separated by miles and new marriages, they come together still joined at the hip of friendship. Paula Elmore demonstrates the art of Navajo Fry Bread. 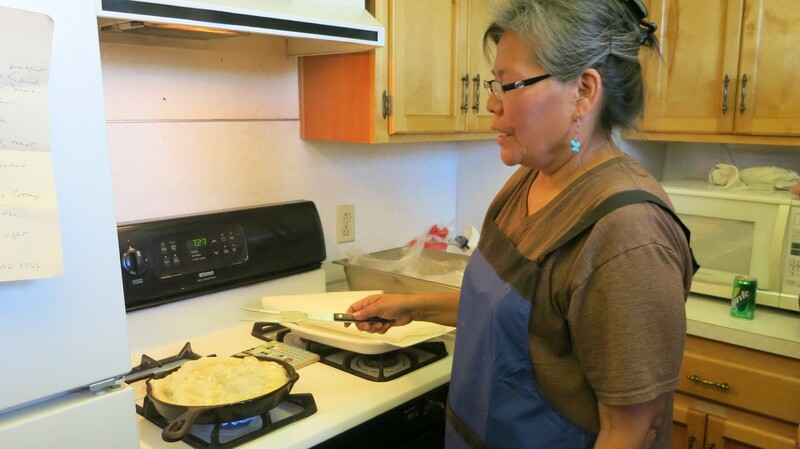 While the charcoal grill heats up, Paula Elmore, who caters at both Good Shepherd and area powwows, demonstrates the art of making Indian Fry Bread. She explains that the Navajo use only flour, salt, warm water and baking soda. As she slaps the dough back and forth in her palms, it flattens into a circle, in the middle of which she makes a hole. Why, I ask her. So that it doesn’t come out puffy like a sopapilla, she says, but also to leave a little room for knowledge. She gently drops the circle of dough, with its hole left for knowledge, into the hot oil. It immediately begins puffing up, browning. She turns it with a fork, and then, voila. We each take a bite. Delicious. It was a calorie counter for the Navajo, Paula says. Only later, when I bother to research the history of Ft. Defiance, do I understand what she meant. Something as simple as Indian Fry Bread has its own story: this is what the exiles had to eat on their Long March, when the other rations ran out. These days, Good Shepherd blends Navajo traditions and Episcopal teachings to help heal the wounds of the past. Mother Cynthia plans to remain there until a Native completes seminary and can take her place. Then we’ll leave, she says. We’ll give it all back to the People. You’ll have to come back tomorrow to read about the wedding. It was a doozie–Navajo, Episcopal, and Buddhist traditions combined. In fact, we were married twice. Meanwhile, check out some of the websites I’ve linked. This entry was posted in Storytelling and tagged Bosque Redondo, Concrete Monolithic Dome, Cynthia Hizer, Good Shepherd Mission Ft. Defiance Arizona, Indian Fry Bread, John Gaw Meem, Kit Carson and the Navajo, Long Walk of the Navajo, Navajo Nation, Pueblo People of New Mexico, Santa Fe adobe style, Santa Fe Museum of Indian Arts & Culture, Storyteller dolls, Yin Yang. Bookmark the permalink.